Andreas has graduated from Computer Science and Bioinformatics at the University of Linz. During his studies he has been involved with a large number of research projects ranging from software engineering to data engineering and at least web engineering. His scientific focus includes the areas of software engineering, data engineering, web engineering and project management. He currently works as a software engineer in the IT sector where he is mainly involved with projects based on Java, Databases and Web Technologies. The items list in a ListView may contain any type of objects. ListView is a parameterized class. The parameter type is the type of the items in the list. 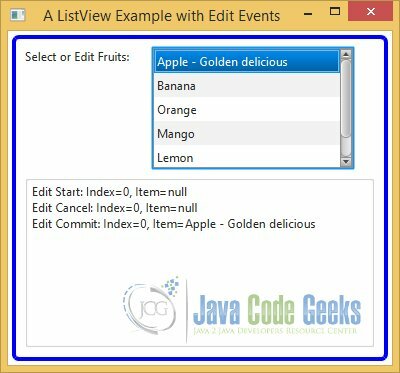 The following examples uses Java SE 7 and JavaFX 2.2. If the space needed to display items is larger than what is available, a vertical, a horizontal, or both scrollbars are automatically added. The above example shows two instances of ListView. One uses vertical orientation and the other horizontal orientation. In single selection mode, only one item can be selected at a time. If an item is selected, the previously selected item is deselected. By default, a ListView supports single selection mode. An item can be selected using a mouse or a keyboard. You can select an item using a mouse-click. Using a keyboard to select an item requires that the ListView has focus. You can use the up/down arrow in a vertical ListView and the left/right arrow in a horizontal ListView to select items. The MultipleSelectionModel class inherits from the SelectionModel class, which contains selectedIndex and selectedItem properties. The selectedIndex property is -1 if there is no selection. In single selection mode, it is the index of the currently selected item. In multiple selection mode, it is the index of the last selected item. In multiple selection mode, use the getSelectedIndices() method that returns a read-only ObservableList containing the indices of all selected items. 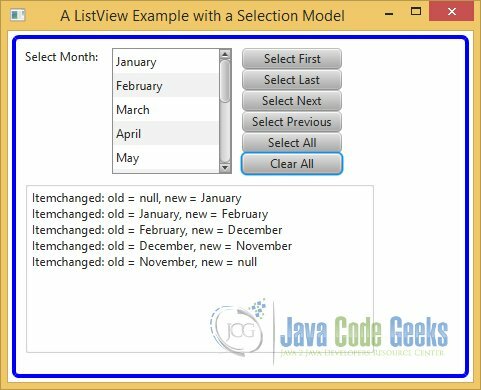 If you are interested in listening for selection change in a ListView, you can add a ChangeListener to the selectedIndex property or a ListChangeListener to the ObservableList returned by the getSelectedIndices() method. The selectedItem property is null if there is no selection. In single selection mode, it is the currently selected item. In multiple selection mode, it is the last selected item. In multiple selection mode, use the getSelectedItems() method that returns a read-only ObservableList containing all selected items. 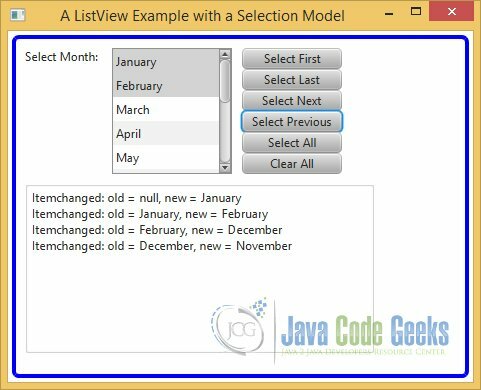 If you are interested in listening for selection change in a ListView, you can add a ChangeListener to the selectedItem property or a ListChangeListener to the ObservableList returned by the getSelectedItems() method. The selectAll() method selects all items. The selectFirst() and selectLast() methods select the first item and the last item, respectively. The selectIndices(int index, int… indices) method selects items at the specified indices. Indices outside the valid range are ignored. The selectRange(int start, int end) method selects all indices from the start index (inclusive) to the end index (exclusive). The clearSelection() and clearSelection(int index) methods clear all selection and the selection at the specified index, respectively. The folowing code snippet demonstrates how to use the selection model of a ListView for making selections and listening for selection change events. The Person class contains only the attributes first name and last name of a person. The class also supports a Constructor, Getters and Setters for each attribute and a toString Method. The following code declares a PersonCell class, which inherits from the ListCell<String> class. You need to update its content in its updateItem() method, which is automatically called. The method receives the item, which in this case is String, and a boolean argument indicating whether the cell is empty. Inside the method, you call the method in the superclass first. You derive a person from the string argument and set the text in the cell. Each item in a ListView is displayed in an instance of ListCell, which a Labeled control. The ListView class contains a cellFactory property that lets you use custom cells for its items. The property type is ObjectProperty<Callback<ListView<T>,ListCell<T>>>. The reference of the ListView is passed to the call() method of the Callback object and it returns an instance of the ListCell class. The control needs to create only the number of cells that are visible. Upon scrolling, it may reuse the cells that went out of the view to display newly visible items. The updateItem() method of the ListCell receives the reference of the new item. By default, a ListView calls the toString() method of its items and it displays the string in its cell. In the updateItem() method of your custom ListCell, you can populate the text and graphic for the cell to display anything you want in the cell based on the item in that cell. Our program shows how to use a custom cell factory to display the formatted names of Person items. The following snippet of code in the program creates and sets a custom cell factory. The updateItem() method of the ListCell formats the name of the Person object and adds a serial number that is the index of the cell plus one. Set the editable property of the ListView to true. 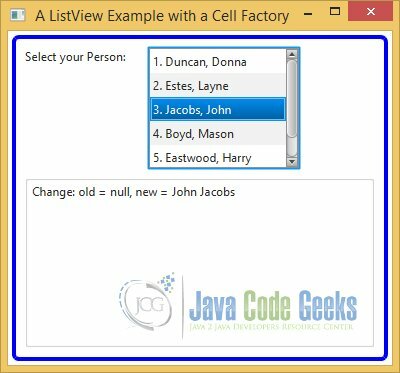 Set the cellFactory property of the ListView to a cell factory that produces an editable ListCell. Select a cell and click to start editing. Alternatively, press the spacebar when a cell has focus to start editing. If a ListView is editable and has an editable cell, you can also use the edit(int index) method of the ListView to edit the item in the cell at the specified index. 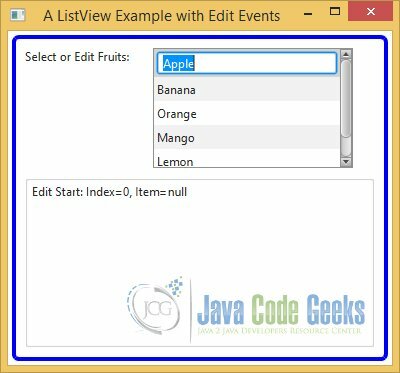 The ListView class defines a ListView.EditEvent<T> static inner class to represent edit-related event objects. Its getIndex() method returns the index of the item that is edited. The getNewValue() method returns the new input value. The getSource() method returns the reference of the ListView firing the event. The ListView class provides onEditStart, onEditCommit, and onEditCancel properties to set the event handlers for these methods.